This will be the third review for Strollo’s hot garlic beef jerky. The ingredient list has since been tweaked, and improved health wise. This 1.5 ounce/42 gram bag was kindly submitted for review by the owner, Michael Strollo. 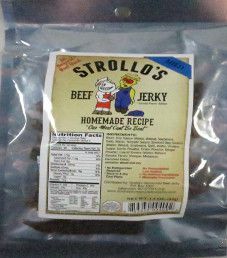 This will be the second review for Strollo’s hot garlic beef jerky. The ingredient list has since been tweaked, and improved health wise. This 1.5 ounce/42 gram bag was graciously submitted for review by the owner, Michael Strollo. This will be the second review on a 1.5 ounce/42 gram bag of Strollo’s mild beef jerky flavor. The ingredient list has been tweaked since this mild flavor was first reviewed back in September 2014. 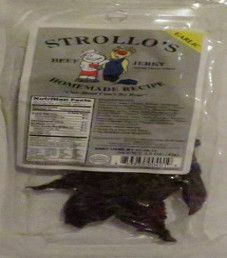 This jerky was kindly submitted for review by the owner, Michael Strollo. 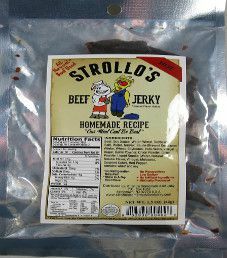 Note: For a more recent taste review, open Strollo’s – Garlic Beef Jerky (Recipe #3). 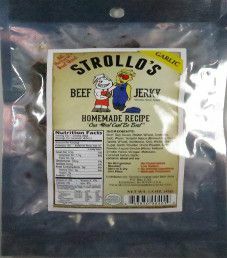 The next review on Strollo’s beef jerky will be on a 1.5 ounce/42 gram bag of their garlic flavor. 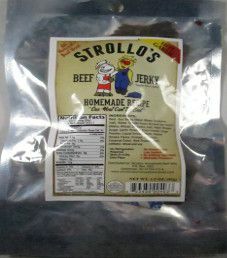 This jerky was kindly submitted by the owner of Strollo’s, Michael Strollo.